If you have listened to the show for sometime, we would love to have you leave feedback on iTunes. We know not all of you use iTunes, but for those that do, it helps us become more visible. If you don’t use itunes, your feedback is still valuable. Visit our web page at https://scifidinerpodcast.com and leave a comment on the show notes or email us at scifidinerpodcast@gmail.com We want to know! 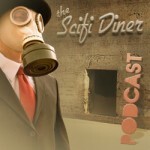 On this science fiction podcast, we will be interviewing Star Trek Novelist David Alan Mack, giving away two of his novels, Battlestar Galactica: The Plan, finally we are getting more Firefly, whadda ya mean we’re getting a fifth season of Heroes, NBC’s Day One literally becomes Day One, Sami Rami tucks in Spiderman 4 and says night night to it, Avatar once again makes James Cameroon the King of the World, and Defying Gravity and Gamer are out in DVD. We’ll give you our thoughts! David Alan Mack: is the national bestselling author of nearly twenty books, including Wildfire, Harbinger, Reap the Whirlwind, Road of Bones, and the Star Trek Destiny trilogy — Gods of Night, Mere Mortals, and Lost Souls. His first original novel, the supernatural thriller The Calling, debuted in July 2009 to critical acclaim. Recently published novels by David Mack include The 4400: Promises Broken, Star Trek Vanguard: Precipice, and the expanded edition of his Mirror Universe tale The Sorrows of Empire. Coming in 2010 are More Beautiful Than Death, an adventure inspired by the 2009 feature film Star Trek; and the SF espionage-thriller Zero Sum Game, the second book of the Star Trek: Typhon Pact miniseries. Farpoint Con – Meet up. Let us know if you are going. Link in show notes. Beta Testing Star Trek Online – ask the listeners are you playing this? Best of 2009 – Miles – best movies of the past decade – SciFi in Five – at the end of the podcast. Question: What do Star Trek Voyager, BSG & Heroes all have in common? I finally saw the plan. I don’t know what you guys thought, but if you were a BSG fan this was phenomenal. Had to wait till TV aired it. Felt like I was visiting family. Not for the casual BSG watcher. Would have felt disjointed. Makes sense right before Caprica. Miles what did you think of the plan? Joss Whedon’s beloved Firefly/Serenity is long gone, but you can’t stop the signal: Fans can look for more adventures of Capt. Mal Reynolds and the crew of the doughty ship in a series of short stories coming soon from Titan Books. Writer/producer Jane Espenson—who wrote one episode of the Fox sci-fi series but is a longtime friend and colleague of Whedon’s going back to her days on Buffy the Vampire Slayer—told us that she will be writing one of the stories, centering on the characters of Kaylee and Wash (obviously set in a time period before the events of the movie Serenity). Espenson’s Firefly episode was “Shindig,” the fourth episode in the series, which deals with a society dance and a duel. It’s best loved by fans for Kaylee’s appearance in an over-the-top flouncy ruffled dress. Call it the Incredible Shrinking Show. Remember NBC’s proposed sci-fi series Day One? First it was a show. Then it was a one-season show. Then it was a miniseries. Now, it’s just a TV movie, said Angela Bromstad, president of prime-time entertainment at NBC and Universal Media Studios. There is still hope for continuing the story if the standalone movie version is a hit. “Absolutely,” she said. “If it performs, absolutely.” She has not scheduled Day One yet. Isn’t this the BSG syndrome? Test the waters then see what happens? The once-flagship series’ ratings have dropped, and its fans have slammed the show’s meandery plots and confusing character arcs in recent seasons. But NBC executive Angela Bromstad said no decision has been made on the show’s fifth season and added that the network will hear a pitch from creator Tim Kring before making one. It’s standard practice for show runners to pitch for a season renewal, Bromstad added: “They always do,” she said. She did confirm that if she renews Heroes, the show can continue to operate on its current budget without any more cuts. “Actually, Heroes has already been very responsible in having a good budget, so I don’t think that we’d be looking at cutting it further,” she said. James Cameron’s Avatar topped the box office for the fourth straight weekend in a row, taking in an estimated $48.5 million domestically to become the top domestic hit of 2009. The domestic tally for the sci-fi epic is now $429 million, placing it sixth among domestic hits, the Associated Press reported. Worldwide, Avatar has now taken in about $1.34 billion, second only to Cameron’s Titanic ($1.8 billion). Daybreakers, meanwhile, opened in fourth place with $15 million for the Jan. 8 weekend. Seems like the problems hanging up Spider-Man 4 are more serious than previously reported: Nikki Finke’s Deadline Hollywood is now reporting that director Sam Raimi and his entire cast, led by Tobey Maguire, have dropped out and that Sony Pictures will reboot the series with a new director and new cast for 2012. Raimi could now move on to his proposed World of Warcraft movie, or a film based on Dennis Lehane’s The Given Day. Wait…isn’t this Smallville? Peter working for the high school newspaper all over again? A group of Iraq War veterans looks to clear their name with the U.S. military, who suspect the four men of committing a crime for which they were framed. Bradley plays Lt. Templeton ‘Faceman’ Peck, Liam Neeson takes on Col. John “Hannibal” Smith) Sharlto Copley is Capt. “Howling Mad” Murdock and Quentin Jackson plays B.A Baracus. The program follows the adventures of eight astronauts on board the international spacecraft Antares, the next ambitious manned space mission after the Mars landing. The lives of the astronauts are being constantly recorded and broadcast back to Earth both as part of an ongoing documentary and as part of mission monitoring. In spite of a libido-suppressing device worn by each crew member, referred to as “HALO” for “Hormone Activated Libido Oppressors”, romantic entanglements develop among some crew members. Further complicating their lives is a mysterious storage pod which contains something referred to as Beta, which is exerting an impact on their mission. Gerard Butler stars as Kable, condemned criminal and globally famous super-soldier in the ultimate multiplayer game, “Slayers.” Human controllers direct each thought and move of real-life prison inmates battling in hyper-intense environments – where the goal is freedom and the penalty is death. But when Kable suddenly decides he wants out, his rebellion threatens the twisted plans of game creator Ken Castle (Michael C. Hall, TV’s “Dexter”), who will stop at nothing to crush the renegade commando in this taut, adrenaline-packed action-thriller.